“Here we go again!”; the ever-popular feelgood musical Mamma Mia! is extending its West End booking period at the Novello Theatre until 20 October 2018. The ABBA hit-filled musical will celebrate its 19th birthday in London on 6 April 2018, having proven a smash hit all around the world. Mamma Mia! is Judy Craymer’s ingenious vision of staging the storytelling magic of ABBA’s timeless songs, with an enchanting tale of family and friendship unfolding on a Greek island paradise. To date, Mamma Mia! has been seen by over 60 million people in 50 productions in 16 different languages grossing more than $2 billion at the box office. In 2011, it became the first Western musical ever to be staged in Mandarin in the People’s Republic of China. The show is also currently on its first ever UK Tour. The production originally opened in London at the Prince Edward Theatre on 6 April 1999, before transferring to the Prince of Wales Theatre in 2004. The musical re-opened at the Novello Theatre in 2012. Its 2008 movie adaptation is currently the highest grossing live action musical film of all time. 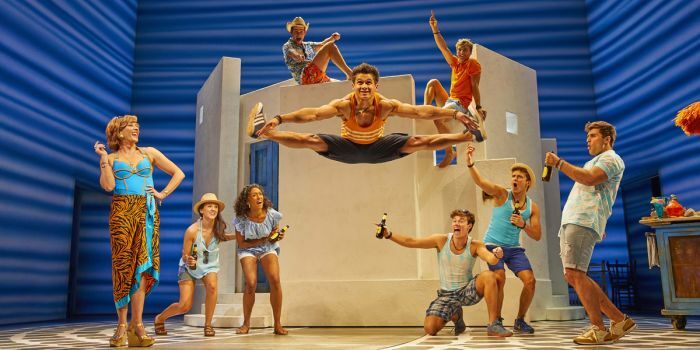 Singing pop hits from Dancing Queen to Voulez-Vous, and Does Your Mother Know to Take A Chance On Me – not forgetting, of course, the iconic title track – Mamma Mia! in the West End currently stars Sara Poyzer as Donna, Kate Graham as Tanya, Jacqueline Braun as Rosie, Richard Trinder as Sam, Alasdair Harvey as Harry, Dugald Bruce-Lockhart as Bill, Georgina Castle as Sophie, and Christopher Jordan-Marshall as Sky. Book your Mamma Mia! tickets at the Novello Theatre today.